I have been doing analytics for a few years now, and made some friends who are also analysts. However, anyone among my friends from my hometown, uni etc. does something similar. Data science is being a popular topic and that´s why quite often I am asked if I am a data sciencist, or even about the reasons I am not. I always explain it using an analogy that everybody can understand. I have also spoken about it with some fellow analysts, who agree with me. So, finally I have decided to write about it. Let´s think of two musicians: a violinist and pianist. Both, a violinist and pianist are basically musicians. Thus, from the outside they may seem to be doing the same thing. A similar mindset and a special creativity to develop an activity like creating music. Attended a music school for several years. A taste for keep learning, and always pushing their own boundaries. The same talents likes identifying by name individual pitches. The same basic hard skills like music theory, reading / writting music. A to-do approach to work, knowing that practice is the key to mastery. The ability to play several intruments, even from different instrument families. The posibility of easily learning a new instrument that will open up some professional alternatives. Like learning the Viola if already play the Violin, or playing the Viola with the hands if already play it with the bow, moving into electronic music with a keyboard if already can play the piano etc. And as the Spanish musician Enrique Bunbury says “we all suffer from the same ´pain´”. A violinist is a violinist. And a pianist is a pianist. No violinist is going to think that a pianist is that similar to him. They should see themselves close to other musicians within the violin family, like the viola or the bass violin. And only similar to the pianists if we talk about music in a wider sense. Just change to change the words violinist & pianist for digital analyst & data sciencitist. And also change musician for data geek. As a digital analyst, I know how to create insights (music) using certain tools like Adobe Analytics (i.e. the violin). Actually more than one tool type, like tagging solutions (the bass violin). I can also do data qa and debugg (tune the instrument). I can writte tracking requirements (writte music). I understand looking at the console what others have done (read music). I also know many other analysts from other companies (violinist from other orchests) etc. However, it does not mean that I am almost the same as a data scientist (i.e. pianist). Not even that we would be necessarily good at that, at least in the short term, or plan to become one. Well, let´s see. Esta entrada fue publicada en EN - Analytics Philosophy & Events el 2 julio, 2018 por Geekeando en Analytics. I like juggling and analytics. And what it’s around as well. When I juggle or i.e. I track something complex for the first time, I can do things that one time in the past I even thought I would not be able to do. It’s mainly about practice and eagerness to learn. When I juggle (or I do analytics) always -and actually is always- I can learn something new, and have a new challenge to face new problems, or situations I have not faced before. And it nurtures -among other things- the which to exceed oneself, the curiosity or the creativity in the approach. At some point, dealing with new things becomes part of everyday life. There isn’t just a right way to juggle in terms of posture, the way you open your hands etc. Same thing in Analytics. There are different alternatives and approaches depending on what you do at a specific moment. I have learnt to be flexible enough depending on the context, with a focus on solving the problem/trick. Juggling is a social thing. Most jugglers are pretty easy going and sociable. Juggling let you meet and interact with like minded people, with whom you normally share more things. Same thing in Analytics, assuming you attend regularly to conferences or events for us. It happens to me all the time that the balls fall down. And it happens because I am constantly pushing myself up, trying new stuff out of my comfort zone. But finally I manage to learn and do the trick correctly, and each time in less time. The willingness to progress and doing well more complex things is what define your progress. And it also happens in Analytics. Attending a juggling contention is fun. Attending Measure Bowling, Measure Camp or the ‘celebration’ at the Adobe Summit is fun as well. Same thing with some MeetUps. I have had always a good time and also had the chance of meeting new people, some of them becoming friends later. Any idea? Any comment? Any complaint? Leave your comment and I will get back to you. You can also contact with me via email geekeandoenanalytics@gmail.com o through my Linkedin and Twitter profiles. Esta entrada fue publicada en EN - Analytics Philosophy & Events el 13 febrero, 2017 por Geekeando en Analytics. 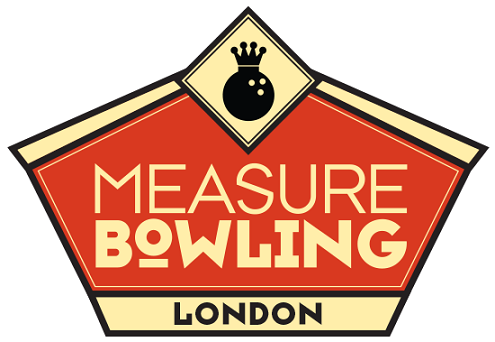 Measure Bowling will be back on the 2nd of June. 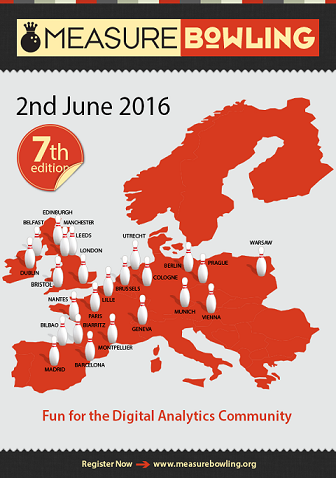 For the 7th time, Digital Analysts from about 25 European cities will go bowling together. For those who don´t know Measure Bowling or don´t work in Analytics it might seem like a weird concept. I have seen seen a few poker faces on friends or even my boss when I have tried to explain it / convince them to attend. But once they´ve experienced it, they agree that it´s pretty cool, and ask me why it doesn’t happen more often. Why should you attend Measure Bowling? Well, let´s recognize that our favourite part in a conference is at the end – when you have the chance to talk with others in a relaxed environment, and also talk with / ask questions of someone in particular, and of course, socializing. 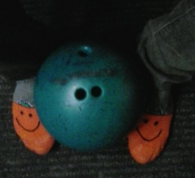 Measure Bowling goes directly to this part since there are no talks. We play one or two bowling games, taking part in a local competition, but also an international one between the different cities. In most cases, it also includes dinner, (which is highly appreciated by the Spaniards) and some beers. There is also a t-shirt competition, normally themed around nerd t-shirts. Unfortunately, I don´t have the pic, but the best one I have ever seen said “NO, I will not fix your computer” A few of us also wear nerd socks on the evening (yes, there is a pic for this). No white socks please, though! There are also prizes (books, toques, Amazon vouchers etc). If you are reading this, I will tell you that you should definitely include Measure Bowling in your agenda, and attend the one happening in your city. Or…you could organize your own! To keep reading, please click on the link below to the original post. Esta entrada fue publicada en EN - Analytics Philosophy & Events el 23 mayo, 2016 por Geekeando en Analytics.